Apparently I am on some kind of chocolate and peanut butter kick, but I can’t help it! Those two flavors go so well together and honestly what’s not to love? 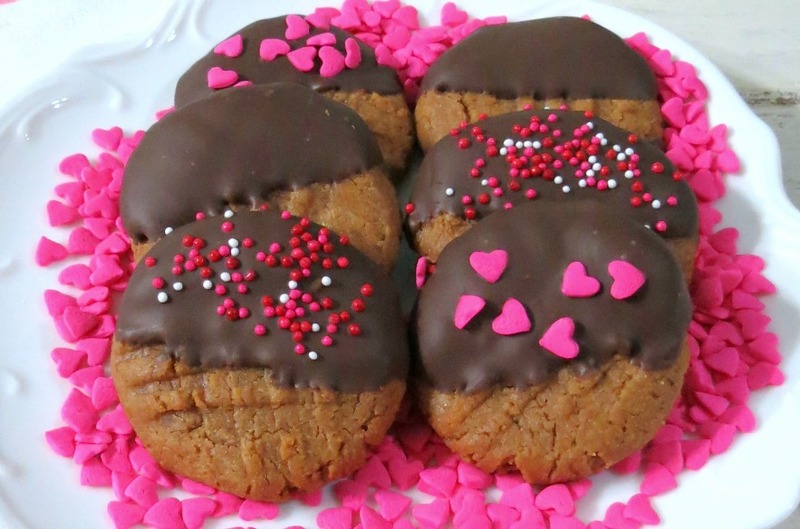 So today I created another version of my peanut butter cookies which are just perfect for Valentine’s Day. 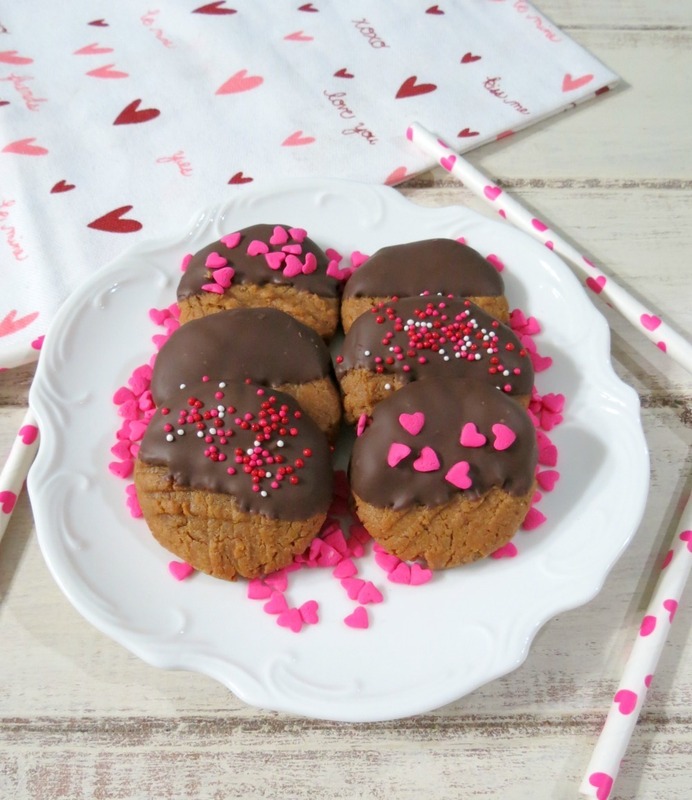 These peanut butter cookies taste just amazing! They have a nice crunchy shell with a soft middle and totally scream peanut butter! Then to boot the melted dark chocolate on them is to die for. 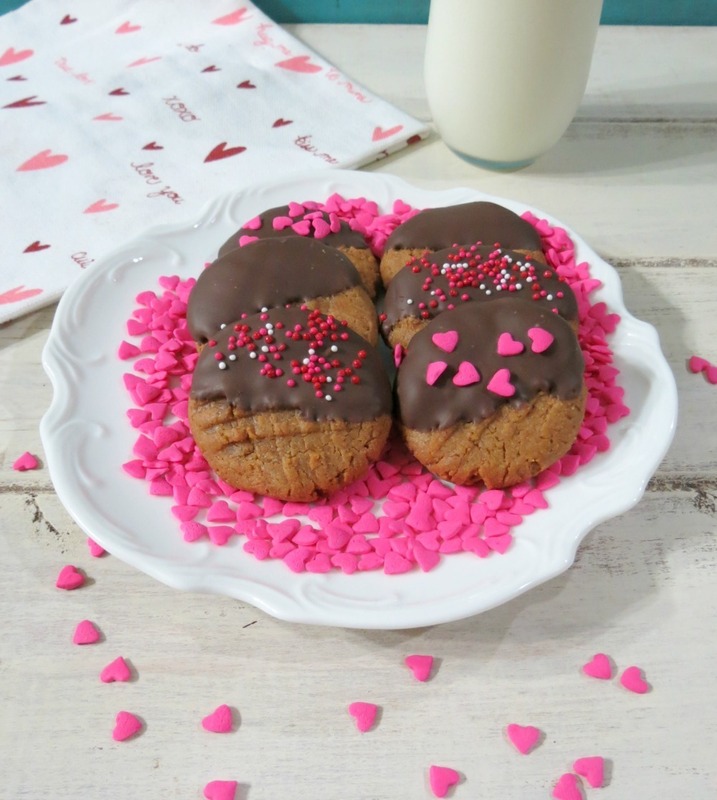 The chocolate adds a little pizzazz and really takes these cookies to another level. 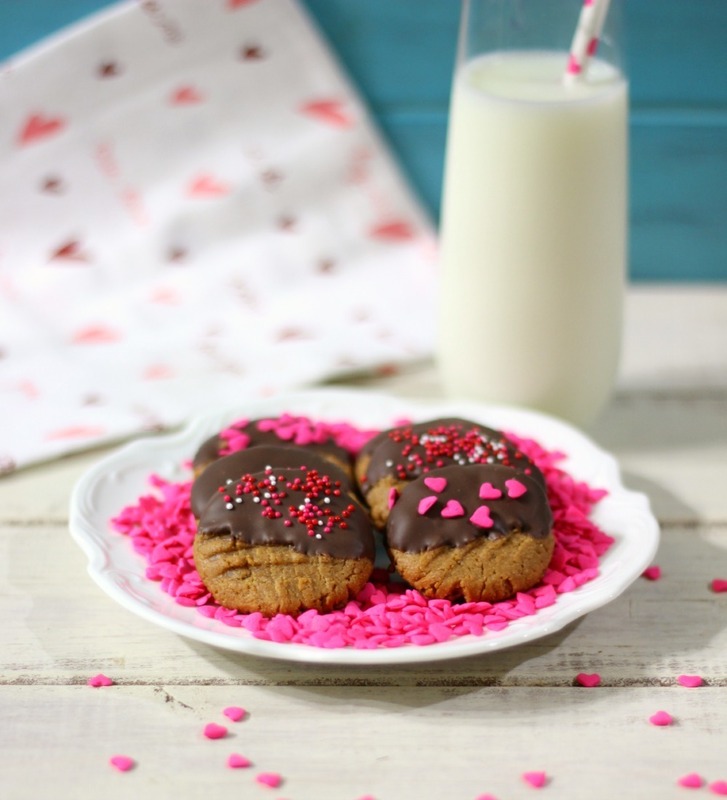 And of course you must have sprinkles for a Valentine’s cookie, which I think makes the cookies looks just adorable. I simply love them. My Husband was thrilled to death when I told him I had PB cookies for him to take to work. Yes, the man who is sick of Peanut Butter was so happy for these cookies. I kind of slacked on making him weekly cookies and bread for him to have at work. He looked at the cookies and said pretty, can I take them all to work? How could I have not said yes to that? So off the whole batch went. I’m kind of glad because as I write this I could only imagine how many I would pop in my mouth. To make these cookies, I took the traditional 3 ingredient PB cookie recipe which is egg, peanut butter and sugar and zipped it up a bit because I didn’t want an uneven, broken up looking cookie. I made my cookies with an extra egg, brown sugar and cornstarch. It all came together beautifully and no broken or cracked edges. they all turned out perfectly even, moist and delicious. I actually like this peanut butter cookie the best so far. Simple, easy, gluten-free and low-calorie! What’s not to love? 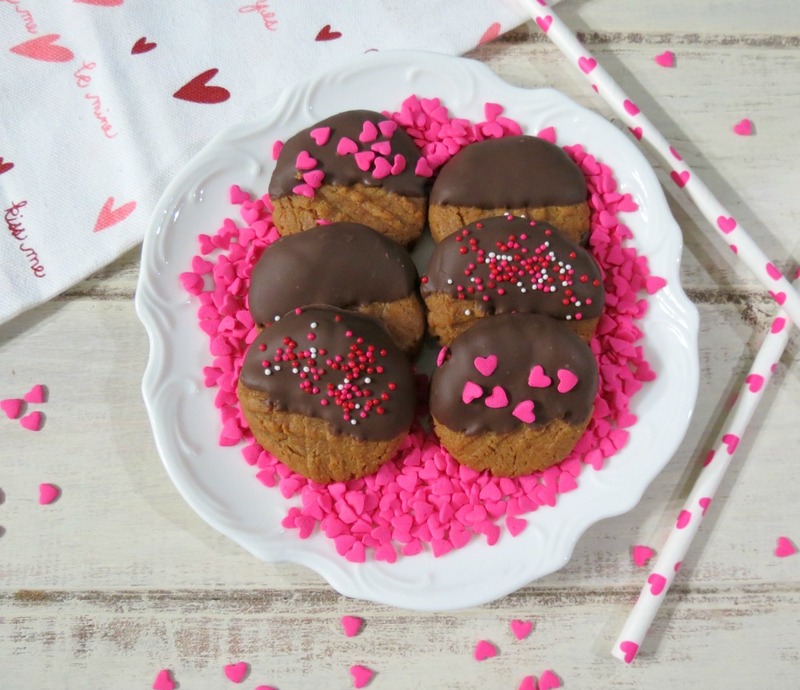 A crispy peanut butter cookie with a soft center that is dipped in dark chocolate and sprinkled with little candies. In a bowl, add peanut butter, brown sugar, eggs and vanilla extract. Beat until combined. Beat in cornstarch. Roll about a tablespoon size of dough and place on prepared cookie sheet. Gently flatten with your hand. With the tine of the fork, press into the cookie to make a cross pattern. Note: If you are not going to dip the cookies in chocolate, I recommend after you roll the dough into a ball, roll it in a little granulated sugar to add a little more sweetness. Then continue with the directions. Bake in oven for 7 - 9 minutes, until lightly golden on the bottom. Let cookies cool for 2 minutes and place on a baking rack to cool completely. Meanwhile in a microwave safe bowl, add chocolate and microwave for 20 seconds, stir and microwave in 10 second increments until chocolate is melted, stirring in between each increment. I found using a pyrex measuring cup worked great and easy for deep dipping. Dip half the cookie in the melted chocolate and place back on baking sheet. Add sprinkles if desired. Let the cookies sit until chocolate hardens about 45 minutes. Store in an airtight container with parchment between each layer. Gosh I have been on a chocolate dipping kick and I still have a couple more recipes that involves chocolate dipping that I am going to try to get to this weekend. Maybe I shouldn’t? I have had my fair share of chocolate lately, yet I can’t quit. I guess it’s because I found Ghirardelli melting chocolate wafers on sale at Target for $2.44 a bag. I couldn’t resist that price, so I bought them up. Shame on me! I just love that darn Target! Well today I am off, I was invited to a Tillamook Cheese and Yogurt Brunch in San Francisco today. I can’t wait! I just hope the rain holds off, but I doubt it will. Nothing worse than wandering through the city in the rain. I got my Husband to go with me and this will be his first blogging event. I wonder how he will react when everyone takes pictures of their food? It’s going to be fun! Have a wonderful Saturday, stay warm and safe! I know the East Coast is supposed to get hit with a snow storm again. You poor Guys! Nothing wrong with a chocolate-peanut butter obsession. I mean how could you not be obsessed with the two best flavors known to man!!!!!!!!!!!!!!!!!!! Super easy recipe … need to make. They remind me of the chocolate chipped chocolate chip cookies that my grocery store sells (Wegmans). 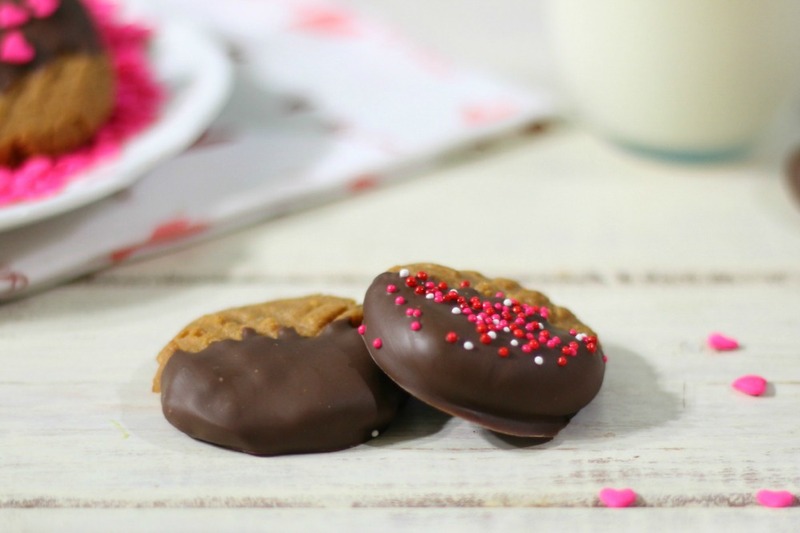 Chocolate dipped cookies are classic! I just love Wegmans! I miss them! Living in CA the grocery stores are just not the same as the East Coast. Chocolate and Peanut Butter are always great flavors in my book! Looks great! I’m always up for peanut butter and chocolate! These look so good. I get you had a great time in SF too. I had a blast in SF today. I just wish it wasn’t rainy. Your to funny!! Now you Husband is the lucky one!!! Get to sample and eat all of your delicious foods! It was so great to meet you yesterday after all this time 🙂 These cookies look so yummy, and perfect for Valentine’s Day!! You decorated them so beautifully! Have a great week. I love these! 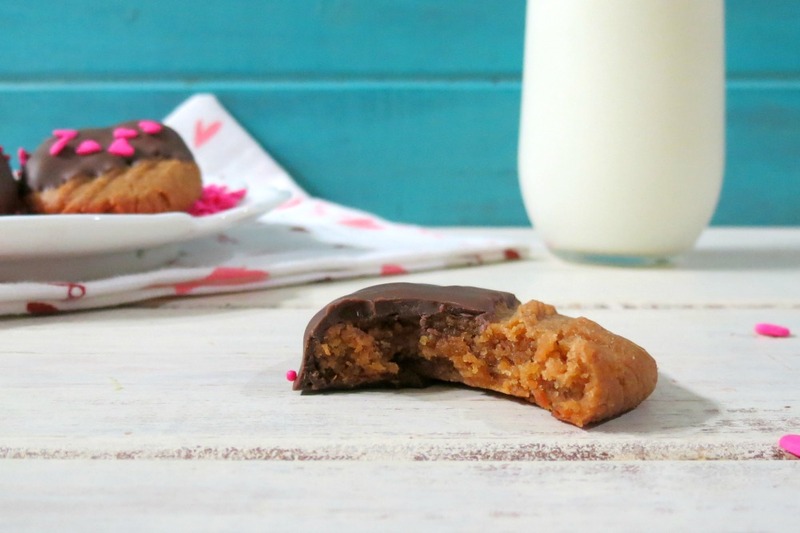 Peanut Butter cookies are my weakness, and dipping them in chocolate is just glorious. And your pictures are so pretty too. I think I’m ready for V-Day now!